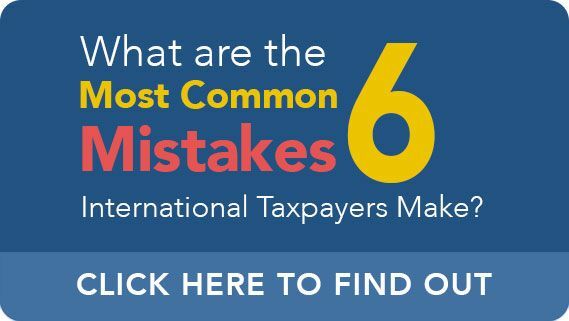 What are the Six Most Common Mistakes International Taxpayers Make? Please forgive the straight-talk in this special report that I have prepared for you, but I have seen the consequences of these mistakes too many times. Taxpayer’s contact me every day needing international tax preparation service or want to return to US tax compliance utilizing the IRS Streamlined Procedure. Here is the truth. I have worked with Taxpayers like you for 30+ years and I’ve discovered that what you really want is to have a qualified professional “give it to you straight” when it comes to your US/State tax compliance only paying the lowest tax the law allows. So, I’m dispensing with the “technical jargon” during this short report and I’ll provide you the simple unbiased truth based upon my experience. Are you ready to listen? Did you know that many people “simply have no experience” in selecting a qualified tax professional experienced with your international tax issues? Even if you have worked with a tax preparer, previously? It’s sad, but true. Far too often I see folks settle for a less than satisfying experience with their tax professional because they think that’s all that’s available – well, here’s the great news, it’s not! You can (and should) expect the same great service from your tax professional as you would from any business that provides 100% client satisfaction with no excuses, when you know what to look for – and that means you can trust that your tax situation is handled properly, and your problems disappear. As a CPA, it upsets me when I hear the (countless) stories of Taxpayer’s getting in trouble with the IRS or are unwittingly not in compliance with US tax law during the most difficult times in their lives or feeling lost with nowhere to turn, simply because they never found a trusted advisor to help get their affairs in order (or it wasn’t done well or right). Well, here’s the great news, you’ve already taken the first step towards shedding real light on your situation by requesting this free report and further–you’re about to discover how you can get real support and avoid the costly mistakes made by so many when choosing a qualified CPA to address your tax preparation and planning needs for you and your business. Here are the six biggest mistakes I’ve seen and how to make smart choices for you and your business. The issue with a software like this is that anticipates you have a complete understanding of US and State tax law and/or expects you to have sufficient computer skill to produce a “true & correct” tax return. Did you know that many CPA’s like to sarcastically joke to one another about how “good” those online tax preparation programs like (TurboTax®, TaxAct®, etc.) are for THEIR business? Why would that be? Using those programs can end up leaving thousands (or much more) of dollars of YOUR income in the coffers of Uncle Sam or the State Tax system, even if you follow all of their instructions to a tee. I see it all the time – frustrated clients bringing in online-generated tax forms, astonished at all the “hidden savings” my staff and I are able to find for them. Not to mention all the errors we find by people who think they did everything just right, but still got stuck in unfortunate traps for the unwary that you just wouldn’t know about. The security you get with these online services is actually false security. So, I hope you are with me: YOU AGREE that choosing to work with a highly-trained and qualified professional, who will put your interests first–rather than settling for the false security of tax returns prepared online or with a cheap unqualified preparer alternative is really in your best interest. Neither tax preparation and/or planning should be provided on an hourly basis. Any CPA who knows his or her stuff will quote you a package fee for tax preparation. If not, beware because you may be paying for your CPA to learn how to do things OR you are going to end up with big expenses down the road when things change in your life and/or the law. Worst of all, your tax preparer is being reactive to problems rather than proactive for tax protection. You, of course, want the latter. And really watch out if the package fee you are quoted is less than a few thousand dollars. A CPA offering tax preparation for $1000 or less is either cutting corners somewhere, luring you in to sell you something expensive, ugly and unseen on the back end or simply will not be able to provide you with the quality service and care you and your business deserves. There are CPA’s out there who have based their business model on churning through as many new clients as possible, undercutting their fees and providing little more than you would get with a do it yourself online option. If you are going to go that route, you might as well go online and do it yourself. But, don’t! You and your business deserve better than that. Are all of your fees flat fees? What about ongoing assistance after you complete my tax returns? How do you proactively stay in contact with me to make sure me and my business stay at the top of your mind? What happens when I call with tax questions 2 years after my returns were completed? What if the questions are about something other than my tax returns? What about my tax liability? Will you ensure I pay the lowest tax the law allows? Will you keep my situation up to date as my life, the law and my income change? How does that get paid for? You need to be satisfied by the answers you receive to these questions, as they often sneak up after-the-fact and can be a major drain on your cash flow and peace of mind. There are actually multiple problems I’ve seen here. 1. What happens when things change? To advise you well, your CPA needs to be in regular communication with you and understand what’s going-on in your life and the regular operations of your business. Is that happening with your current CPA? If not, how are you being properly advised? Plus, your life is going to change. Period. You will want to plan for retirement and/or be prepared for major financial decisions, for example, that impact your taxes, who takes care of your money, who makes financial decisions for you. You will buy a home, sell a home, start a business, close a business, invest in something new, sell it, enter into a partnership, make a loan to a brother-in-law, etc. Your income will change. 2. Will your CPA make sure your income is protected? It not, your tax plan will fail when your family needs it. And your business is not adequately protected. You will retire, age and need help taking care of yourself. Your kids will worry. 3. Will your CPA be there to assist your children and ensure that you have sufficient income to be cared for the way you want? And that doesn’t even account for changes in the law. The tax code changes just about every year. Many of those changes have a direct impact on your family and your business. 4. Will your CPA make sure you stay informed about those changes and how they affect you, your business, your family and your tax plan? Make sure your CPA will not only keep in touch with you about changes in your business, life and the law, but will also welcome your calls and not charge you in six minute increments to respond. 5. Does the package fee include a regular review of your tax plan? If not, then you’ll be faced with having to initiate reviews yourself, and having to pay additional fees for the privilege, at that. You and I both know that life is about more than just “making money.” Think about this: you have to choose between being infinitely wealthy or infinitely healthy, which do you choose? Health, of course. Or this: you have to choose between leaving your child a million dollars or the values and insights that are most important to you. Which do you choose? I think we’d all say the values and insights, right? The money is replaceable, but without the values, the money will be quickly lost. So why is it that most CPA’s don’t (or won’t) address this very obvious truth? If you have worked with a CPA, you know that the tax returns most CPA’s create focus entirely on tax compliance, when what we all know is most important is the intangible wealth – values, insights, stories and experience. Too often, the most valuable family assets are lost at death because the intangible assets are left out of tax planning completely. That’s why we focus on passing your business, your money AND your values, insights, stories and experience on to the next generation as part of the planning we do with your family at no extra charge. It’s just part of our culture and service. It’s true, CPA’s have a bad reputation. Phone calls not returned for days or even weeks on end, surprise invoices for hundreds (or thousands) of dollars, and generally being unaccommodating or surly are just a few of the complaints I have heard. Look for a CPA who has a team supporting him or her (a solo CPA without support cannot help but get overwhelmed and not be able to return phone calls) and a process for answering phones and returning phone calls. Hold out for a CPA who will never send you a surprise invoice in the mail and never charges for his or her time hourly (or in six-minute increments). Ask your prospective CPA whether he or she has a culture of service and what that looks like in his or her office. If s/he looks at you like you are crazy, leave, fast. Unfortunately, with the way that most CPA’s present themselves to the world, it seems like we’re all the same. We all seem to offer the same services, for pretty similar fees. If I weren’t working every day in this industry, I’m pretty sure I would think that all CPA’s in our industry were the same. You see, each CPA does have certain qualifications. Some might be experts at tax law, or in working with corporations or with debt collection, or a whole variety of different things…but are they really providing what you, the head of your business and family, wants and needs? You want to be able to work with a caring professional who knows you and your family, not one of those “cattle call” shops, where you’re squeezed in with a bunch of other people, and seen by harried, poorly-trained tax preparers. Or worse: a “corporate” shop which can’t shake the legalese and can leave you feeling cold by not relating to you as a family with sincere desires. You want a CPA who understands the unique needs of YOUR business and YOUR family. Have young children at home? Look for a CPA who has specialized training in serving the needs of families with young children. They really are quite different. Have elderly parents you are caring for? Look for a CPA with specific training in serving the needs of the elderly. Have a child with special needs? Your CPA needs to have had training in serving the needs of families with special needs. Have a business you care a lot about? You need a CPA who gets that business and the life of an entrepreneur. And whatever you do, do not hire a generalist who does not have specialized training with international tax, estate and/or business planning UNLESS they are co-counseling with a lawyer experienced with international tax issues, too. Here’s the bottom line: You want a CPA who can confidently help you make good decisions. That’s ultimately what it comes down to – you want to feel empowered, informed, and sure about the decisions you are making and it takes a special kind of CPA to help you in that way. That’s the hallmark of the way that we embrace as your CPA. I trust this Free Report has opened your eyes to important insights you need to have before hiring a CPA. Some of them may be ones you already knew in your gut, you just never had them verbalized before. Knowing this before you engage a CPA for your family and/or small business will ensure your business is primed for continued growth, and your family will be cared for the way you want, no matter what. Yes, choosing the RIGHT CPA is an investment of time and money … and, I will add, a wise investment indeed. I say “wise” because the consequences of poorly-prepared or incorrect tax returns are awful in the short and long term for you. Even though I would love to help your family, I won’t engage in “salesy/scarcity” tactics to urge you to call right now, but if you are excited to find a relationship with the kind of CPA I have described – caring, service-focused, helping your family with US tax compliance — I do have an incentive to reward you for getting on our calendar now. As your CPA, I am serious about making sure that you have tax preparation/planning and compliance services that works for you and your small business — both now, and in the long term. That’s why I’m going to such extraordinary lengths to demonstrate my good faith. The bad news is that I’m only able to accept two of the IRS Streamlined Procedure Certificates per month and two of the discounted Tax Preparation Certificates because I devote a substantial chunk of my time to existing clients. If you would like to be one of the two people I meet with or take advantage of a big discount this month (and you qualify for this offer), please do call or email me now. When you do, make sure that you include that you would like to utilize either one of these IRS Streamlined Procedure Certificate or Discounted Tax Preparation Certificate, that you have a Certificate, and my Client Services Director will give you two options for a meeting. Until then, I look forward to working with you! Assist legal counsel to determine the best course of action that will resolve your offshore tax issues. Assist with the drafting of the required non-willfulness statement required under the Streamlined Filing Compliance Procedures of the Internal Revenue Service (Streamlined Process). Assist with determining eligibility for the Streamlined Process with the understanding that IRS has the final say on eligibility and there is no guarantee of its agreeing with our determination. Assisting in the determination of US foreign related forms required to be filed. Assist in preparing exculpatory statements to be included in the return where appropriate, for example, if estimates or assumptions are employed due to any necessary records required for US tax reporting not being available. This is not uncommon because, generally, non-US banks do not have to conform US tax reporting including the preparation of US tax information forms. This agreement does not cover representation in an IRS audit, appeal or in litigation with IRS or the Department of Justice over any asserted tax liability or FBAR penalty. I agree to represent you and to use my best efforts to advise and assist you in obtaining a satisfactory resolution of your problem. If you need tax preparation services utilize this Certificate for a $500 discount on our package price. I have prepared tax returns and provided clients tax-planning advice for the last 30 years. I specialize in this area and have clients around the world. My objective is to make sure you keep every tax dollar you legally deserve. To begin a professional relationship, I need certain “sensitive” information to open a file for you and your family. That includes your legal name (must match your social security card), social security number, birth date, occupation, mailing address, W-2’s & 1099’s and financial statements for self-employed…in addition to the information requested below. Please use my Secure Document Portal to send me the information I requested. Please do not use regular email for sensitive information. You may submit your information to me in any manner that is convenient for you. I must tell you that it pays to be organized. To determine the complexity of your returns to provide you with a “firm” estimate as to the cost of the service. That estimate and the scope of work are outlined in an Engagement Letter that is sent to you for your “review and approval”. I am not engaged until you approve the terms and conditions of the relationship. You maintain control over the whole process at all times. I will prepare the returns and send them to you, initially, in PDF format (Adobe Reader). After you review and approve the returns, I prepare a filing copy and a copy for your files and mail them to you by USPS or electronically, as appropriate. I am also able to electronically file your returns with the government.